Kill a vampire masquerading as a Visiting Advisor. Warn the jarl of the vampire threat. Find and take evidence to the jarl. (Alternate) Discreetly kill the Visiting Advisor and return to Isran. After speaking with Isran, you will be sent to inform the jarl of a vampire threat within the court. After informing the jarl, you will be told to provide evidence of the threat; this can be done by pickpocketing the Visiting Advisor for his orders. The visitor can usually be found in the main court room of the jarl's hall. Return to the jarl with the note and you will be informed that you can kill the visitor with no retaliation from the guards. Alternatively, you can discreetly kill the Visiting Advisor without obtaining the note. Once the vampire lies dead, return to Isran. The Visiting Advisor is detected by Detect Life rather than Detect Dead, despite allegedly being a vampire. He is also immune to the Sun Fire spell. If you have a bounty in the assigned hold prior to this quest, guards will attempt to arrest you upon killing the Advisor. If the jarl has given you permission to kill the Advisor, your bounty will not increase, but you will still be pursued for any bounty you already have. If you attempt to pickpocket the advisor and fail, he will attack you. If this occurs in front of other NPCs, they will then attack the advisor. 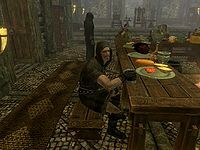 For example - If the advisor location is Whiterun and you are Thane of Whiterun, you can wait until everyone in Dragonsreach is sitting down at the dining table, then pickpocket the advisor in plain view. The NPCs will kill the advisor, and you can tell the guard that you are the Thane to dismiss your crime. If you finished Season Unending, this quest will automatically be completed. It is impossible for the advisor to be at the court of Maven Black-Briar or Ulfric Stormcloak, due to their unique voice types. Isran will only assign Dawnstar or Riften as target locations for this quest. 10 Isran has sent me to <Alias=Capital> to warn <Alias=Jarl> of a vampire masquerading as a visiting advisor to <Alias.PronounPosObj=Jarl> court. I am to destroy the beast. If I fail to secure <Alias=Jarl>'s permission first, the guards will consider it a murder. 255 Finishes quest I've destroyed the vampire in <Alias=Capital> masquerading as a visiting advisor to <Alias=Jarl>'s court. 300 Finishes quest <Alias=Jarl> is no longer the Jarl of <Alias=Capital> and the vampire no longer poses a threat. On the PC, it is possible to use the console to advance through the quest by entering setstage DLC1RH07 stage, where stage is the number of the stage you wish to complete. It is not possible to un-complete (i.e. go back) quest stages, but it is possible to clear all stages of the quest using resetquest DLC1RH07. Esta página foi modificada pela última vez à(s) 14h06min de 13 de julho de 2015.